So one beach trip and a couple pounds heavier I'm back…Over the last week I enjoyed the ocean, sand, family, and lots of great food and drink. Therefore, the upcoming blog posts will be featuring waist friendly meals as I try to get my pre-vacation figure back. 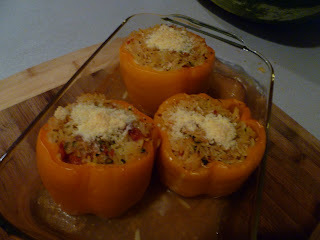 Last night I made these orzo stuff peppers, which had tomatoes, zucchini, and a little bit of pasta. That can't be bad for you right? Preheat oven to 400 degrees. In a medium bowl combine the tomatoes, zucchini, ¼ C parm cheese, garlic, herbs and a little salt/pepper. Bring the broth or stock to a bowl in a small sauce pan, add the orzo and cook about 4 minutes. In the mean time cut the tops off of the peppers and remove the seeds and ribs. Drain the orzo (be sure to reserve the cooking liquid) and add it to the veggie & herb mixture and stir to combine. Spoon the mixture into the peppers and place them in a casserole dish (1.5-2 quarts). Pour the orzo cooking liquid into the bottom of the pan, cover tightly with aluminum foil and cook 45 minutes. Remove dish from oven and carefully remove the foil, the steam escaping will be really hot! Sprinkle peppers with reserved cheese and place back in the oven for 15 more minutes. Let peppers cool for about 5 minutes before serving. 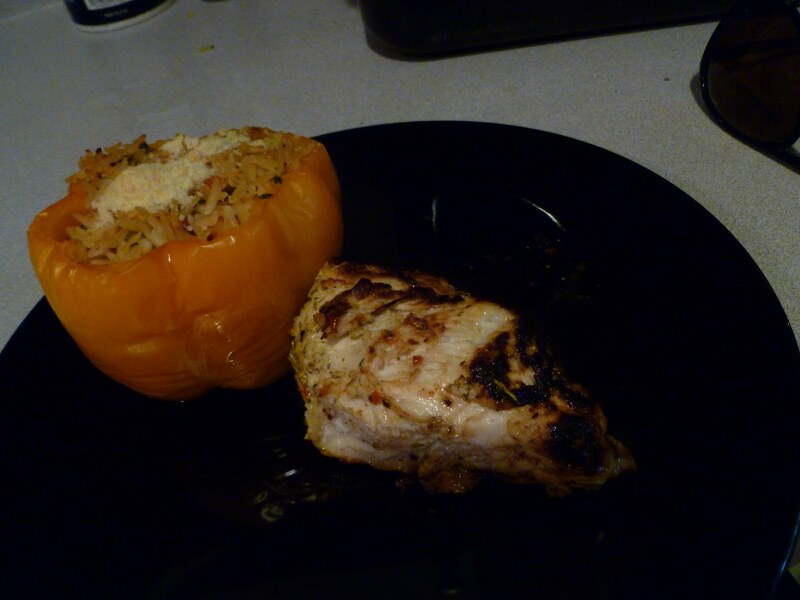 I paired these peppers with cast iron chicken breast, recipe to come later in the week! It was a perfect, easy weeknight meal!